The bulk of my Wardrobe Sudoku is done! I’ve completed the 4 tops and 4 bottoms by this point. While I’m not exactly 100% happy with any of my makes at the moment, I am happy to be working to completion on this challenge. I think it is teaching me important things about finding time to sew, trusting sewing intuition, and how a theoretical wardrobe and a wardrobe in reality need to differ. Also lots about color proportions. I’m sure I’ll spend a lot of time over-analyzing my final Sudoku revelations in a later post (since I’ve already started amassing some thoughts there), but in the meantime, here is the info on the last of my Sudoku bottoms! 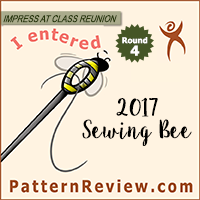 My final pattern was BurdaStyle’s February 2014 #129. Oh man, I love these! Another great style. 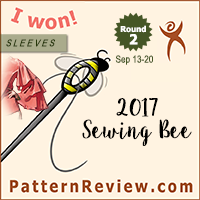 There are certainly a few things I’d love to adjust and alter before I use this patten again, but I will be using this pattern again. Hopefully soon. My pants! Ah, I love them! Crazy pattern that is subtle enough to not look crazy! The fit on the leg is bang on. Granted, I had to do a bit of fiddling to get that, but, it looks good! Waistband turned out nice! And the back fits the bum pretty well. I might want the faux welts positioned a tiny bit differently, but, otherwise, it’s great. A look inside the waistband (with a hook over the zip, and a button further down the waist), and a close-up of the back pocket faux welt. Pattern Description: Women’s skinny trouser slanted pockets and faux welt back pocket. Pattern Sizing: Burda sizes 36-44. I made a straight size 44. Were the instructions easy to follow? Very easy, though I followed my new favorite YouTube video once again for the fly front tutorial. Otherwise the instructions were very clear and straightforward. The only part that would give a new seamstress pause would be the instructions for the faux welt on the back of the pants. Honestly, they really don’t make sense unless you’ve done the technique before, in which case they actually sort of do, but only because you should already understand how to position things to get them to flip to the proper positions. I’d recommend turning to books/magazines/YouTube for the faux welt pockets and for the fly front if you aren’t totally comfortable with those techniques on your own. Did it look like the photo/drawing on the envelope once you were done with it? Yup. Nice and fitted. Love these pants. What did you particularly like or dislike about this pattern? Likes: The style/fit is great. Definitely my favorite feature. The faux welts give a nice elevated quality to the style. Dislikes: The placement of the faux welts on the back are possibly not in the most flattering position on my particular bottom. Also, their position at the very tip of the back dart gives them a slight tendency to pucker, which would be avoided by positioning them slightly lower. The front pockets also gape. I may have to sew them closed. It is a question of utility vs. vanity. Though the pockets are pretty shallow, and thus not entirely functional, so vanity might win. Fabric used: Stretch corduroy print from Mood. I LOVE this fabric! It is soft, and stretchy, and has an adorable pattern, and washes like a dream. Love it. It was beautiful to work with, though, being corduroy, it did generate a lot of fuzz. My only real complaint is that, when it does stretch, you can see the white cotton underneath the pile. It means that all my seams are a bit more visible than I’d have liked, but, it’s ok. Also, it is pretty thick corduroy. Which makes certain things (like the back faux welts) a bit bulky. It also means it is warm. Like, really warm. Like, I’m probably not going to get to wear these until October because it is now practically summer here and they are so warm. Which, clearly, means I need to sew a lighter weight summer pair. Pattern alterations or any design changes you made: None really. I fit the legs with what I would call a “variable seam allowance.” I’ve got really muscular calves and thighs from skating, so I used a 3/8″ seam there, but I sewed more than the allotted 5/8″ seam allowance closer to the ankle to get a really tapered look. I think this has to do more with my extreme leg shape than any commentary on the pattern drafting though. I have the same problem in RTW, so I was able to adjust this accordingly as I sewed and it worked great. Also, I used YouTube as reference for the fly front construction and the faux welt construction, but it is basically a different set of instructions for essentially the same technique, so I don’t consider that a true change. Would you sew it again? Would you recommend it to others? Absolutely yes, to both. I’ve already got fabric earmarked for a second pair of these. I may leave off or change the front slant pockets, and reposition the back welts a bit, but, on the whole I’m really excited to have, like, a million of these in my wardrobe. I wants them in all the colors. All. Of. Them. Totally would recommend this pattern, but probably to intermediate seamstresses or higher, if only because I think a newer seamstress would get frustrated with Burda’s instructions for the critical sections of the back welts and front fly, and might not know where to find some good additional resources. Conclusion: Love them. Sad, because they really will be too warm to wear during the summer, but love them. So comfortable, and while I was afraid the corduroy print would give them a juvenile feel, I think it really elevates their level of stylishness. The fit is better than I hoped for, and, with a few minor tweaks this could be a great TNT pattern that I will love for years to come. So, all in all, I’m not quite there yet, and I’m not really 100% happy with anything I’ve made so far for this contest, but, I’m getting it finished, and right now, to me, that is important. Slowly but surely – getting there! LOVE these! Funnily enough, this pattern is in my wishlist on the Burdastyle site… Of the pants you’ve sewn so far, these are my favorite. They really look good on you, and those shoes go great too! I get what you’re saying about the front pockets gaping (though it sure doesn’t show in your photos) – I made a Burda skirt in January that have the very same pockets and they gape. I thought it was my lack of sewing skills. You’ve given me the wish to attempt a pair! The leggings I made in February came out great (wearing them now), so maybe I’ll find a similar pattern to the one you’ve done here and give it a go. After I’ve sewn the boyfriend shirt that’s ready to go. And the summer dress….. Oh and a couple of tanks. Cuz tanks are cool. :-p Oh and that jacket I wanted! I’m making a muslin of these this morning. Bright red. First pair of fitted Burda pants. Heh another pair of Burda trousers to add to my to-sew list. You nailed the fit on those; great job! Love these! The crazy but subtle print makes me smile and the fit is lovely! These look amazing, you are really finding some great Burda pants in your Sudoku challenge.